Blog Update From The Goats – Why October Was Such an Epic Month! 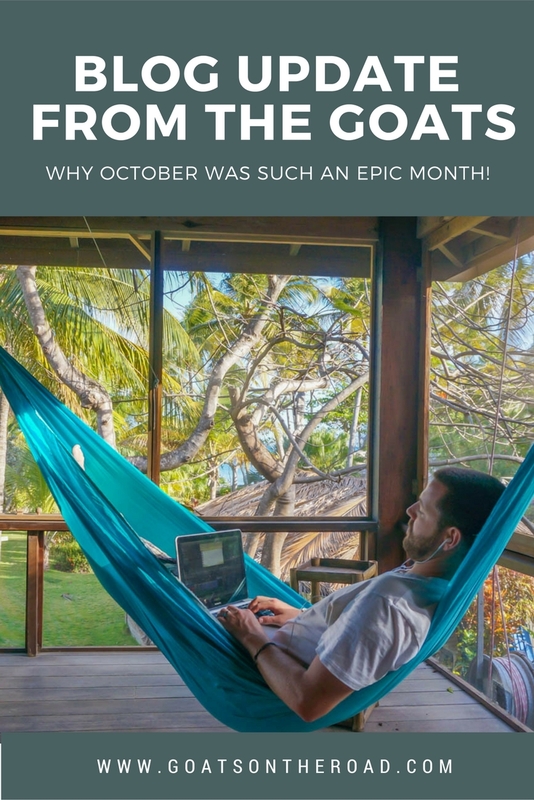 Goats on the Road Posts » Travel Blogs » Blog Update From The Goats – Why October Was Such an Epic Month! We’ve been plugging away at Goats On The Road for 2 and a half years, and we’ve definitely had our ups and our downs. However, we’re very happy to report that more positive things happened for our business in October, than in the other 29 months combined! We’re so proud of the accomplishments we’ve made recently, which we want to share with you. Here’s an update about our digital nomad lives. We hope it will inspire you to set goals and think positively about your lifestyle and your business! 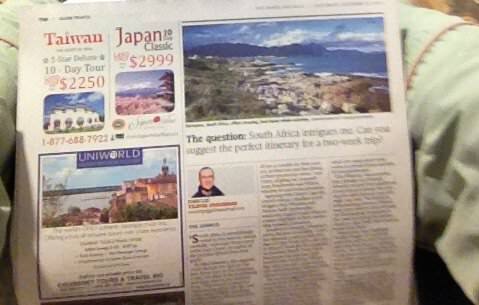 On October 13, John from The Globe And Mail (the largest newspaper publication in Canada) contacted us and a few other travellers to take part in an article he was putting together. What an honour! The article was all about a 2 week South African road trip and because we spent 5 weeks driving across S.A, he figured we were a good fit. The article was published in print and online on October 25th. At the end of September, we landed a couple of new freelance writing jobs. One of them is a permanent column on CreditWalk.ca, where we share our expertise in long-term travel and the financial challenges of nomadic life. We have also had the honour of writing a couple of articles for TransitionsAbroad.com and we’re hoping that we will one day be full-time contributors there as well. 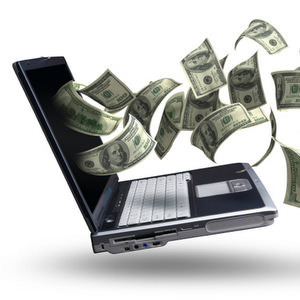 Want to learn how we make money freelance writing? Click here. Back in June of 2013, we followed Adam Costa’s advice and wrote 20 awesome articles on 20 awesome blogs and had them all publish on the same day. It ended up resulting in a sustainable 33% increase in traffic! This month, we finally got around to doing a Guest Post Bomb again, only this time we wrote over 30 articles! This GPB has already accounted for approximately a 20% increase in traffic since we completed it. We’re really looking forward to seeing some new readers and making new connections from this massive outreach. 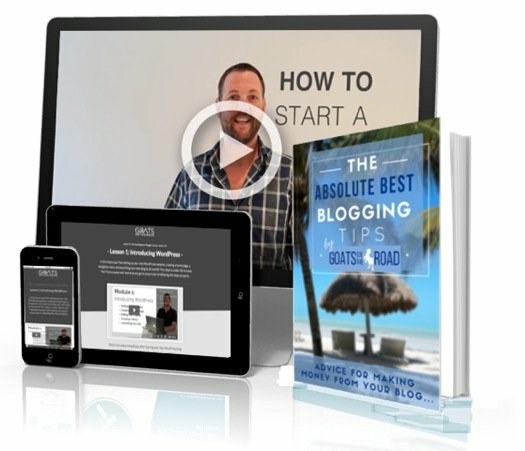 Click here to read about how to do a Guest Post Bomb. Well, we’re happy to say that the Universe listened, and in October we earned that amount and then some! Got to love the art of manifestation. Our income was nearly 3 times higher than any other month, ever. This is an amazing reminder that if you set goals and think positively about them, they can be accomplished. We’re Now Ambassadors for the Backpacker Magazine Series! This was another serendipitous thing that happened to us in October. We’d been following along with Nomadasaurus and their amazing adventure travelling from Thailand to South Africa by land, and when we heard that they were ambassadors for Southeast Asia Backpacker Magazine, we knew that we wanted to be a part of the program. We’ve been lucky enough to have lots of travel gear, gadgets and trinkets sent to us in the past, but we’ve never actively pursued sponsorship. This month, I decided it was time to get some companies on board to help improve Goats On The Road, mainly our YouTube Channel. We want to get some killer footage, but camera gear can be expensive. I contacted GoPro, but I’m still waiting for a reply from their sponsorship department (I’ll keep newsletter subscribers posted on that). Feiyu-tech is an industry leader in camera stabilization technology. 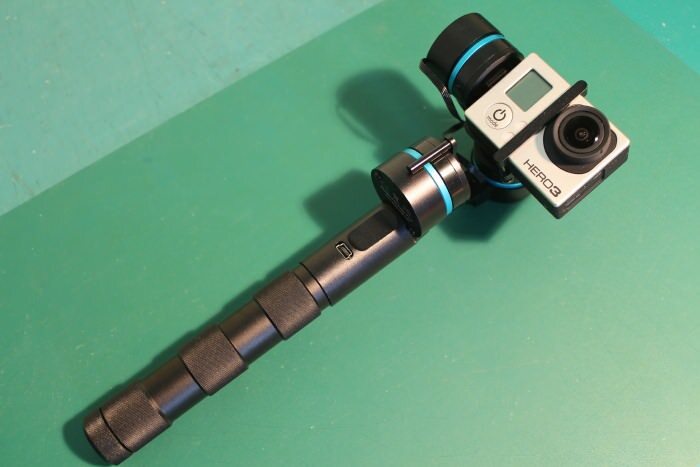 I contacted them and asked for the handheld GoPro stabilizer (for the GoPro that I haven’t been promised yet!) and they agreed to send us one. Now our shaky GoatLife TV and Goat Shows will have a whole new, professional look! We’re really excited to give the new gadget a try. Dan Parlegreco of the Travelling Dan Podcast contacted us and invited us to be interviewed on his weekly show. This was our first time ever being interviewed in audio (not just in writing) and it was a bit nerve-wracking. Actually, it turned out that we sounded alright. If you want to hear us chat about travel and the nomadic lifestyle, you can listen to it here. Lately the blog has been helping us to travel in so many ways. One of them is the opportunity to work with great companies everywhere we go. Generally the way it works is: we contact an airline, boat company, dive shop, tour agency, hotel, etc. and we explain to them who we are, what we do and how many awesome people follow us. We then offer online exposure in exchange for our work. After a 3 week, fully sponsored, independent trip through the Grenadines, we decided to start pitching some cool companies here in Grenada that we thought you guys might be interested in if (when) you travel here. First was Dive Grenada and the owners Phil and Helen were very internet savvy and aware of their marketing strategies. They hosted me on 6 amazing dives and it was not only great to see the underwater world, but it was awesome to meet the two of them and learn about their ongoing efforts to help the reef and marine life here in Grenada. We also hooked up with our buddy Darryl of LovingTheBike.com who has a cafe and bike shop here in Grenada called Mocha Spoke. 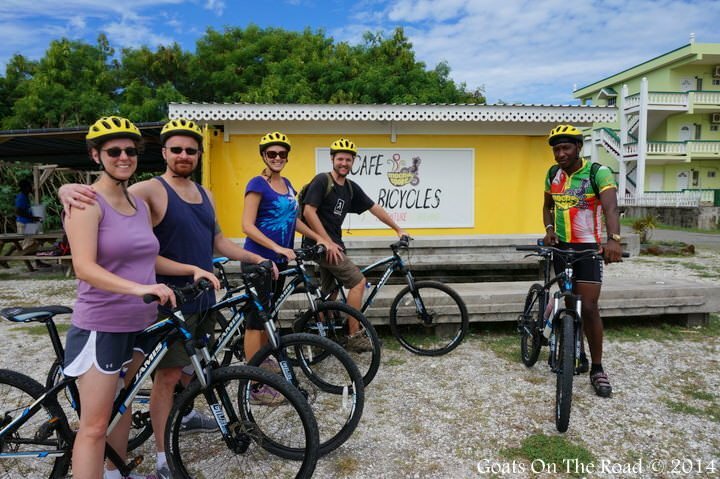 We headed out on an amazing bike tour around the Grand Anse area and ended it all with a delicious lunch at his cafe. We loved our day of sailing with Footloose Yacht Charters last month, so we figured we should get back out on the sea again. Last week we teamed up with True Blue Sportfishing for a day of deep-sea fishing! Video and article to follow. This month, Flipkey added us to their list of 25 Top Couples Travel Blogs To Follow and we’re honoured to be in such awesome company! We recognize many of the wonderful couples on the list. 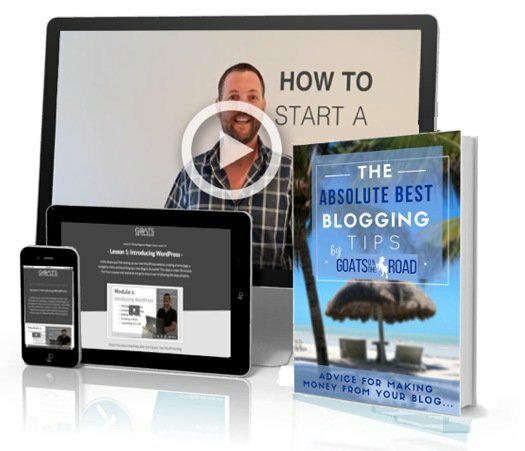 I remember finding this list on the TheExpeditioner.com a few years ago and dreaming of one day joining the ranks of the incredible bloggers. Well, we finally made the cut in October and we came in at number 38! This is the only list I know of that is based on actual Google Analytics traffic reports. There are so many awesome bloggers on it and we’re so honoured to be among them. On October 8th, we featured one of our favourite inspirational bloggers Ryan Biddulph and on October 13th he returned the favour by interviewing us on his site. This lead to some more excellent exposure as Ryan has a huge following of great bloggers, lifestyle designers and travel lovers in general. After being interviewed on Ryan’s site, BloggingFromParadise.com, we were contacted by another great online entrepreneurial site SuccessHarbour.com and we were interviewed by George Meszaros about our location independent business. 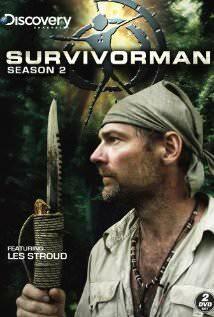 We’ve all heard of Survivorman right? You know, one of the only reality TV shows worth watching? Well somehow, through the wonderful power of Twitter, Les Stroud’s camera woman decided to contact us and asked if we could cover an event here in Grenada next year. As we’ll be travelling somewhere in Central or South America at the time of the event, they’ve offered to fly us back to Grenada to report on the festival next May. We’re still not 100% sure if it will work out, but it would be such a great opportunity for us and we’re really excited about it! I don’t think the event would be on (or related to) the Discovery Channel, but we can hope right? Maybe one day we’ll even meet Les himself! Here’s To More Great Months! It’s great that all of this is happening for us, but what makes us really excited is how far the travel blogging industry has come. Thanks to conferences like TBEX (Travel Bloggers Exchange) and brand awareness campaigns, bloggers are finally getting some credit for their work! More and more companies are reaching out to bloggers. Journalists are starting to work with us, tourism boards are offering better press trips, and bigger brands are partnering with bloggers every day. Soon, the word “travel blogger” won’t sound like a hobby, it will sound like a legitimate career choice (which is what we already think). We can see the future of our blog becoming very lucrative, but above that, we see the possibility for so many more people to break free and live a location independent lifestyle! We’re so stoked to be a part of this movement and we look forward to a future where work no longer has to be a place… for anyone! How was October for you? What goals have you made for yourself, or your business lately? We’d love to hear from you in the comments below! We just felt that it was time to get our names out there…something we had really been slacking on. It increases our traffic as well, connects us with our blogging community and helps increase social media numbers, it´s great! Sounds like the most epic month ever! Can’t believe how much you guys are killing it. So stoked. Thanks for the shout out too. Awesome to be working with you. It was a great month for sure. We need to get to South America so we can start Ambassadoring! If that´s a word? You guys rock, happy to shout out. Wow you guys were certainly busy this month! Congratulations on all your achievements! Great inspiration and motivation. Keep it up, love your blog guys! Thank you so much for the kind words Samantha! You guys are amazing too and have really achieved sooo much! Wow, cool! Great job, guys. I know what you mean about being nervous for being interviewed on a podcast, but a good editor can do wonders! I’ve been on Amateur Traveler with Chris Christensen twice, and it was definitely more difficult the first time. Good for you Sam! That´s awesome. I´m sure it gets easier the more you do…we´ve still just done the one. We only stuttered once or twice..haha. Thanks Justine 🙂 It´s finally paying off after like 3 years! haha. Congratulations on reaching such major milestones! I’ll be following along your inspiring journeys and hopefully learn and apply these lessons to my own blog. Thank you so much. Good luck to you and your blogging future! Congrats to you both! Awesome, awesome progress you are making, it’s always great to see those little wins start adding up into something bigger. I ran across your blog via the roundup post in the World is My Office. Great to follow some other inspiring nomads. Great to connect with you! Your income report is impressive, well done. Once I have better internet, I´ll be surfing around your site some more. sounds absolutely fantastic! You guys obviously worked a lot in the past months! Cross fingers for the GoPro, you deserve one! All the best and keep on posting! PS: The layout of your blog is super cool! Thanks for the kind words. We both work very hard on our site and are happy you like it! Amazing, amazing month you had, and to enjoy it from gorgeous Grenada, how fortunate! While it is nothing in comparison to your amazing month and success, my goal for October was to get 1000 page views. I am relatively new to the blogging world and still unsure what a good amount of growth is each month. So I set my goal of 1000, and I am happy to say I hit it and then some! Woo! Small steps. Thanks to you guys for inspiring me! Whooo Hooo! Good for you. It´s such an amazing feeling to meet goals that you´ve set, isn´t it? That´s the way to do it though, set realistic goals for yourself and celebrate each one that you achieve – no matter how small or big they are. Thanks so much Curtiss 🙂 Basically, we send off an email, or call, and set out what we can offer in exchange for ___. We give our website and social media stats and explain what we’re all about.